The President of the United States was Andrew Jackson, hero of the Battle of New Orleans. In the 5-year-old Republic of Mexico there was great patriotic fervor, but little stability of government in Mexico City. In the quiet northern backwater of Alta California these facts were of little concern. Being so many months travel from anywhere, there was little to affect the pastoral life known by the padres of the missions and their flocks. Trade with the homeland might be a little more erratic, but trade with yanqui ships from New England, banned under Spanish rule, provided ample opportunity to dispose of hides, wines, tallow and the products raised around Mission San Gabriel and the little pueblo nine miles west. The year was 1826 and Fra Estenaga was busily managing the temporal and spiritual needs of the establishment inherited from Reverend Father Jose Zalvidea the year before. The political implications in the arrival of 30 bearded, ragged and filthy fur trappers led by 28-year-old Jedediah S. Smith may not have impressed the gentle padre as much as their audacity in traveling all the way from the Virgin River high in the Rocky Mountains, down the Colorado, across the fiery Mojave Desert and over Cajon Pass to reach the Pacific Coast. In any event, the traditional hospitality for which his mission was famed was bestowed on these professed Christians as they recovered from the rigors of their dangerous journey. As Jed Smith and his hungry trappers were illegal entrants of the province, their stay was limited to a mere 10 days. Re-supplied and provided with fresh mounts, they returned to Utah via the San Joaquin and the Tahoe passes. Within months, the fierce one-legged Smith who had traveled with a second group across the desert to the San Joaquin Valley also made his appearance, counted the horses in the mission herds, and went the same way. Unknown to any of the characters, the great barrier of mountains, plains and deserts standing between American frontiers and American destiny had been breached forever. Returning the following year, Jed Smith's men were ambushed near Needles by Mojave seeking revenge for an earlier attack by Pegleg's party, but Smith and seven survivors nevertheless reached San Gabriel a second time, and were again hospitably received. The next year, Pegleg returned . . . with Walkara and his Ute. Over the next 20 years, migration was limited to a few hundred Americans, many of whom joined the native Californianos in taking advantage of the Mexican secularization of mission properties and herds in 1834. Among the first to profit from the destruction of the mission system was Antonio Maria Lugo, who obtained title to Rancho San Bernardino, along with 14,000 head of cattle. 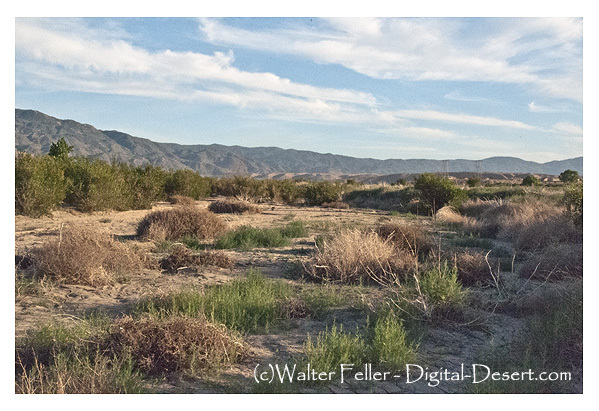 Following the practice of the padres, Lugo drove his great herd over the Cajon to summer along the Mojave River between Las Flores and the Narrows. (Indian hunters always claimed several head, but longhorns were more dangerous to the unmounted Indians than vice versa). Through trading for Yankee goods, marriage and even gambling, Americans acquired ranchos and herds comparable to Lugo's, though nearly all were along the coastal plains. A great many Americans, including President Polk, believed it the nation's "manifest destiny" to straddle the continent from Atlantic to Pacific. Fremont's "Narrative" not only encouraged this idea, it gave specific directions for traveling to California. His appraisal of the weak military defenses of the province may have convinced Polk to act: whatever the case, Gen. Stephen Watts Kearny with 150 men, including the famous Mormon Battalion, marched from Santa Fe on September 25, 1846 to help Fremont, Kit Carson and Commodore J. D. Sloat in the conquest of California. Kearny's Mormons distinguished themselves at the only major engagement of the war here in California, San Pasqual, fought Dec. 6-7, 1846 near Capistrano. The next month the Capitulation of Cahuenga was signed, but the Saints stayed in uniform until the war officially ended the following year. After serving the balance of their enlistment guarding Cajon Pass against Indian raiders, they left for Salt Lake City over the "Spanish Trail" taking along the first wagon ever to cross the high desert (which will become know as "Victor's Valley" in the 1880's". Battalion commander Jefferson Hunt returned the following year with some of the first '49ers, a number of whom attempted an ill fated short cut across Death Valley. In March 1851, Hunt left Salt Lake again with many other veterans and their families to establish a Mormon colony at San Bernardino, on the Lugo rancho. This epic journey involved 437 men, women and children, 150 wagons, over 1,000 animals and took three months to reach Cajon Pass. Another full month was needed to disassemble the wagons and lower them down a steep cliff face into Cajon Canyon with ropes. These were the breed described by the last Mexican governor, Pio Pico, in a poignant letter: " We find ourselves suddenly threatened by hordes of Yankee immigrants . . . whose progress we cannot arrest. They are cultivating farms, establishing vineyards, and erecting sawmills, sawing up lumber, building workshops, and doing a thousand other things which seem natural to them." More, and more, and even more, were yet to trail over the Mojave, up the Victor Valley and over Cajon.